One of the most sought after star patterns on American flags is the "Grand Luminary" or "Great Star" pattern, which consists of the smaller stars being arranged to form one great star on the canton. The pattern was designed by Captain Samuel Chester Reid of the United States Navy in 1818. 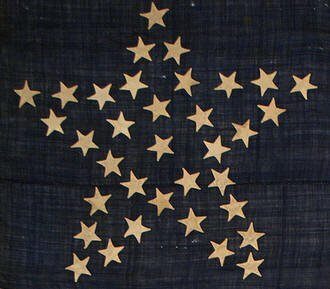 The task set upon by Captain Reid was to design a pattern that would allow for increasing the number of stars on the flag, yet maintain a common distinctive pattern on the flag. While the concept was intriguing and resulted in some of the most interesting and beautiful flags known today, the design was not officially adopted by Congress. 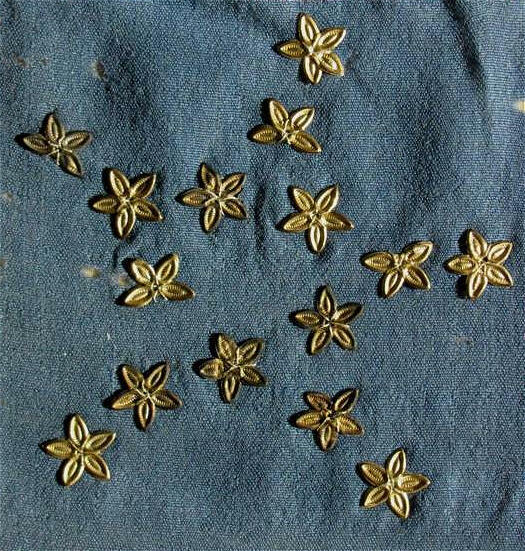 Great Star patterns were made from the early 19th century, and were a favorite design during the Civil War, but their use tapered off following the Civil War as the star counts began to make even the Great Star unwieldy, and they all but disappeared from manufacture by the late 19th century. Below are some examples of the Grand Luminary pattern. The pattern appears on both printed parade flags and those of traditional pieced and sewn construction. 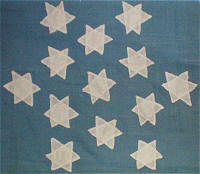 13 Stars, 1860-1880. 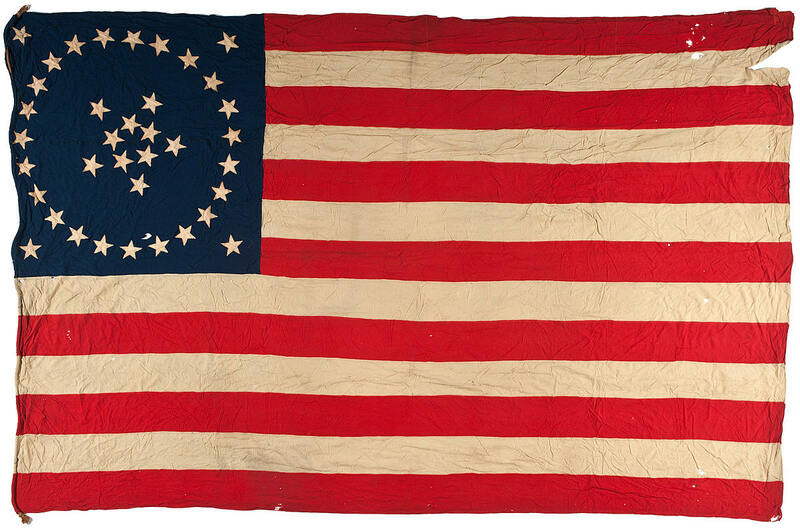 This single-sided homemade flag likely dates to the period of the Civil War to the Centennial. The six-pointed great star pattern is known on only a small handful of sewn flags, and I am only aware of two sewn flags where the six-pointed great star is, itself, made of smaller six-pointed stars. The emblem is representative of the star configuration on the Great Seal of the United States, which consists of a six-pointed star made of smaller six-pointed stars. 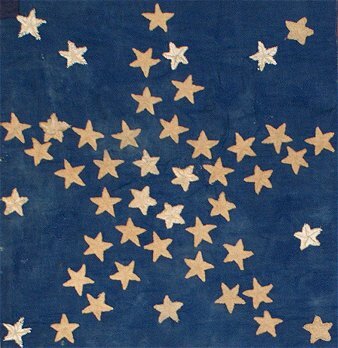 26 Stars, 1837-1845. This silk flag of 26 stars is one of the earliest printed parade flags known. The pattern is intriguing because of its use of various size stars and the folky arrangement. Most likely, there are fewer than ten of this particular manufacture that have surfaced. Flags with 26 stars, of the pre-Civil War period, are rare. The flag celebrates Michigan statehood. This particular flag descended in the family of Admiral Stephen Decatur. 26 Stars, 1836. 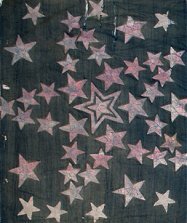 This small hand sewn silk parade flag with 26 painted stars is a tiny survivor from the early 19th century. It was sewn in 1836 by Ms. Mary R. Blair, just prior to the admission of Michigan as the 26th state on January 26, 1837. This is the smallest sewn flag dating from the first half of the 19th century that I've encountered. Note the whimsical style of the hand painted stars. 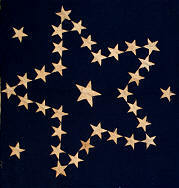 31 Stars, 1850-1858. 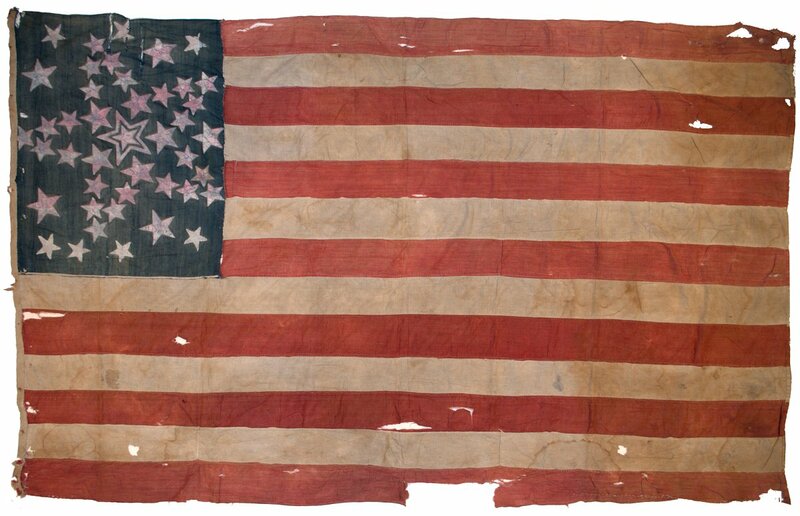 This flag made for California statehood pre-dates the Civil War, and is a rare survivor, being a homemade flag made entirely of fragile mid-19th century cotton fabric. The great star stands straight and proud on the canton, and surrounds a large center star representing California. 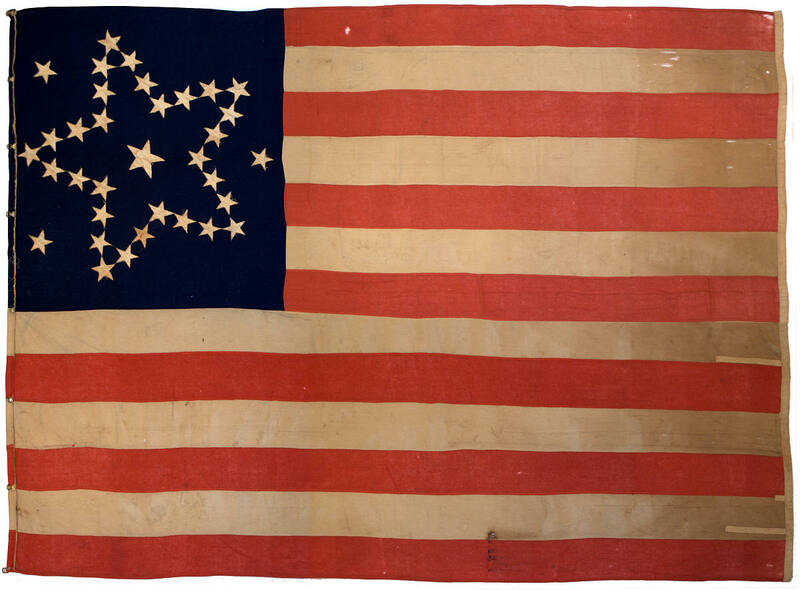 34 Stars, 1861-1863. 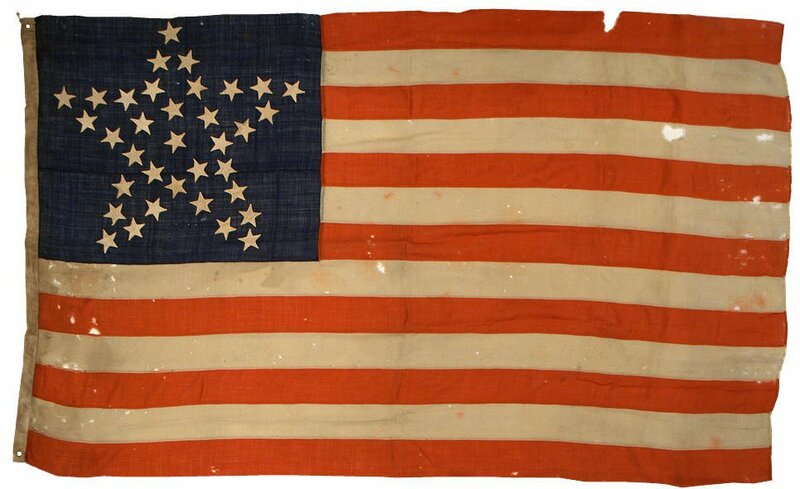 This silk flag of 34 stars is the company battle flag for Company L, 102nd Pennsylvania Volunteer Infantry (originally Company C, 13th Pennsylvania Volunteers). Descended in the family of the company commander, it is exceptionally rare. The flag shows clear evidence of being carried in the field. One can Imagine its beautiful gilt stars, deep blue canton, stripes and silk fringe waving in the breeze on the battlefield among the ranks of the Union infantry. 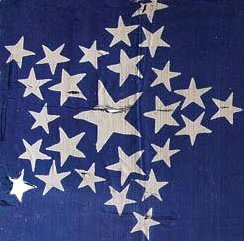 34 Stars, 1861-1863. This beautiful 34 star Great Star flag was located in central New York, near Rochester. Though the specific history of the flag is not known, it dates to the opening years of the Civil War, 1861-1863, and is in a wonderful state of preservation. The puffy, hand sewn double-appliqué stars and unusual arrangement of the inner stars within the great star make this a charming representation of this very rare pattern. 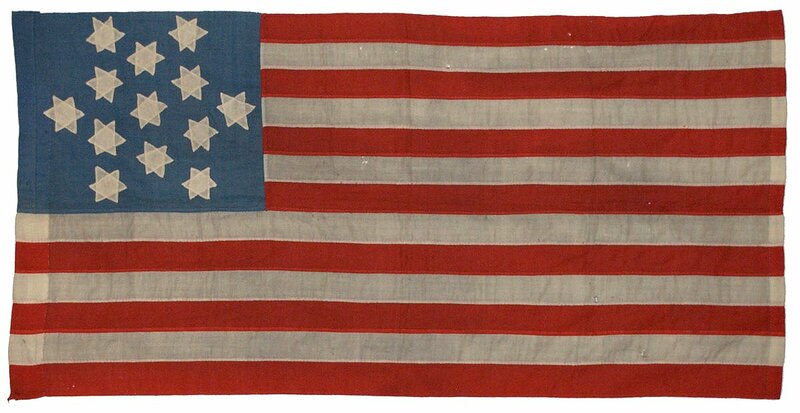 34 Stars, 1861-1863. 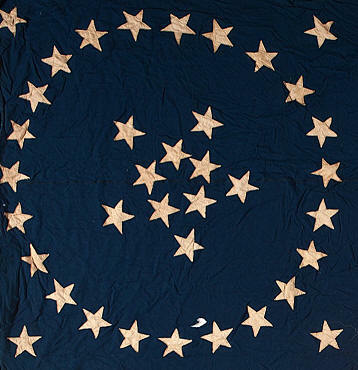 This exceptional Great Star flag, made during the opening years of the Civil War, has several striking features, including three outlier stars, a large Great Star where the star is precisely outlined rather than crossing the center of the star, and the rare trait of a large Center Star in the middle of the Great Star, with its arms precisely pointed to the inner corners of the Great Star. It's made of very fine quality woven wool blend rather than looser, coarser wool bunting. 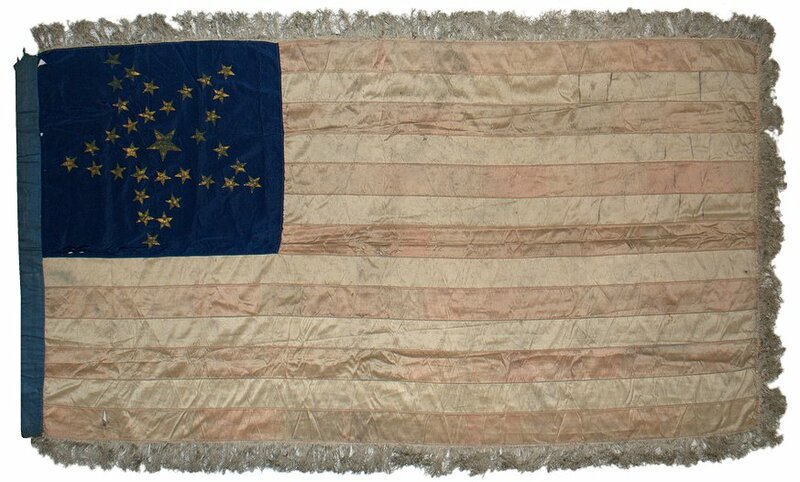 34 Stars, 1861-1863. An excellent example of the type, this flag the unique trait of four large center stars. Though the meaning of this arrangement is not known for certain, it quite possibly symbolizes the four "Border States" of Maryland, Delaware, Kentucky and Missouri, where loyalties were split between the North in some regions, and the South in others. This Great Star flag could represent the desire to keep these important states firmly part of the Union. 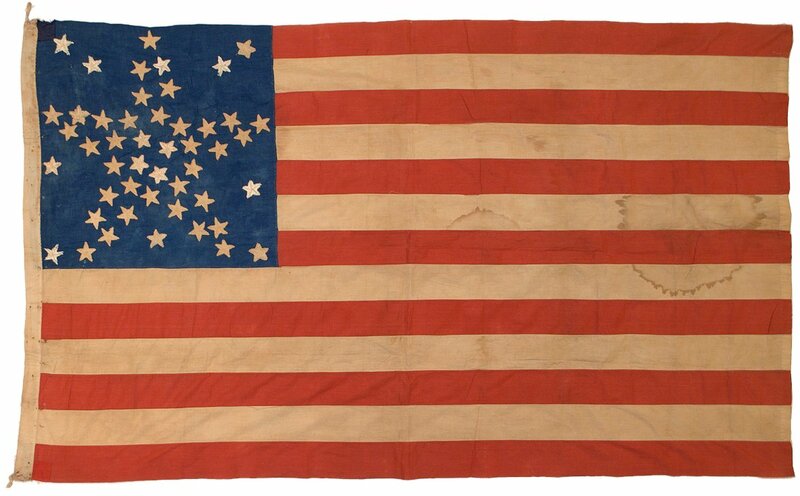 35 Stars, 1863-1865. This classic Civil War Grand Luminary Flag was produced at the height of the Civil War and is a great reaffirmation of the Union that Americans were fighting to preserve. 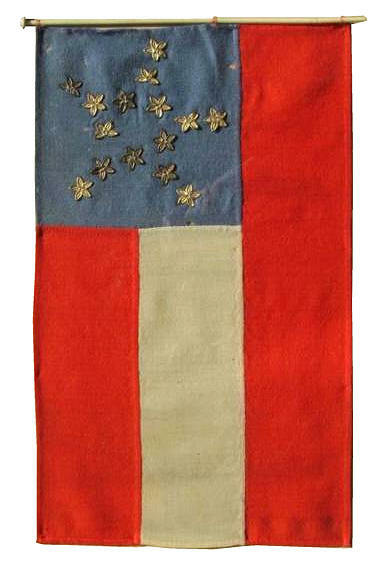 Constructed of sewn cotton stars on wool bunting, the flag's colors remain rich and vivid today. 37 Stars, 1867-1877. An extremely rare pattern for a sewn flag, this 37 star flag combines the medallion pattern style, with a large wreath and four corner stars, with the "grand luminary" or "great star" pattern on a single flag. It is the only sewn flag that I'm aware of that so clearly combines these two great styles of early American flags. 43 Stars, Originally 36 Stars. 1865-1890. One of the latest period Grand Luminary flags known, this flag with its white painted stars shows evidence why the pattern began to become impractical. In order to fit all of the stars on the flag, the maker intentionally moved some of the stars to the spaces between the great star's arms. Taken in combination, the various aspects of the flag--stars of varying sizes, stars rotating on their axes, the "haloed" central star, the tilted great star, the sprinkling of stars between the arms--all add to one of the most exuberant, celebratory expressions one can find on an American flag of any period. 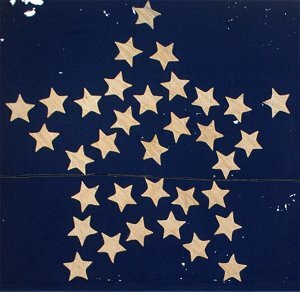 Five large outlier stars are original to the flag, but seven smaller outliers were added circa 1890, bringing the total from 36 original stars to 43 stars. 48 Stars, Originally 35 Stars. 1863-1959. 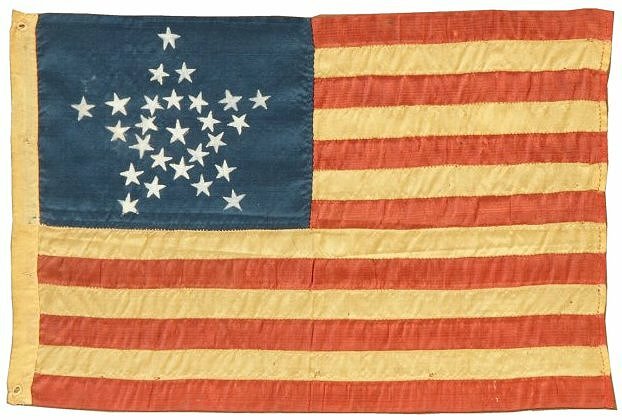 This wonderful homemade Great Star flag originally began its life with 35 stars, born in the middle of the American Civil War. Over the course of many decades, the flag was repeatedly updated to eventually arrive at 48 stars. This is the highest star count for a Great Star flag that I've ever encountered. 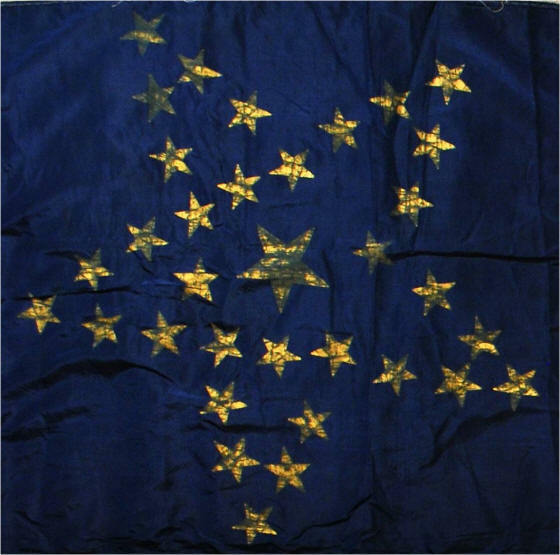 The hand embroidered stars are extremely folky, and although they're all similarly constructed, it's clear that the updates to the stars were done by at least one, and most likely several, different hands from those of the original maker of the flag. 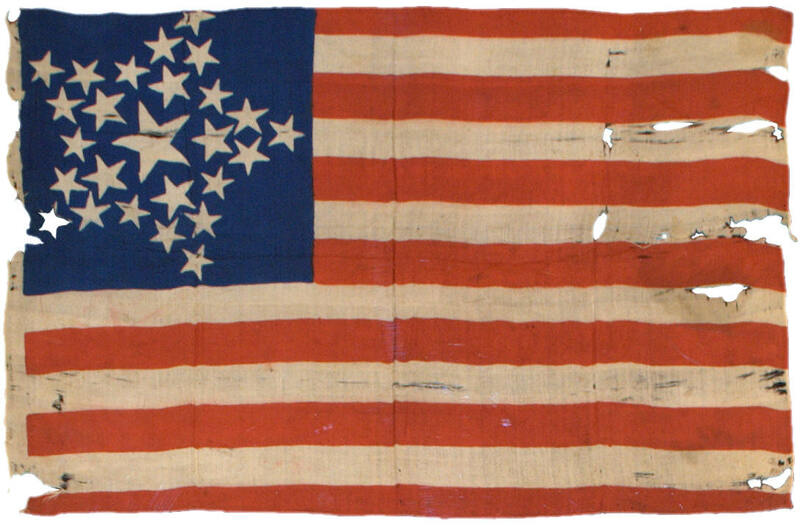 15 Stars, 1861. The only Grand Luminary pattern I've ever encountered on a flag of the Confederacy, the beautiful pattern of gold foil stars affixed to the canton harkens back stylistically to the earliest Grand Luminary patterns of the early 19th century. Union soldiers convalesce at a Civil War hospital under a Great Star flag. Other flags, some with medallions, can be seen hanging in the background.